Most of the content on this website is accessible to any members of the public who are interested in knowing more about ARICD and the Griffiths Scales. These levels of access are hierarchical, meaning that you must have one level of access before you can be granted the next. You can check your access levels by clicking SUBSCRIPTION from MY ACCOUNT. Existing ARICD Members and Tutors will need to first open an account with the website before requesting an upgrade of their account to access new information. If you have successfully completed a GMDS training course, then you must pay a Registration Fee to become a recognised Registered User. After creating an account with this website, you can pay to become a registered user through this website. You can check your account Subscription to see if the website already has you as a Registered User. If you are not sure of your status, contact web@aricd.ac.uk . If you are a Registered User of GMDS, you can become a Registered User of Griffiths III by completing the Griffiths III Conversion e-learning course. Only Registered Users of previous versions of the Griffiths Scales are able to become Registered Users of Griffiths III. To become a new Registered User of Griffiths III you must first complete a two-stage course process (find out more here). At the end of this you will automatically added to to this website by our admin team. 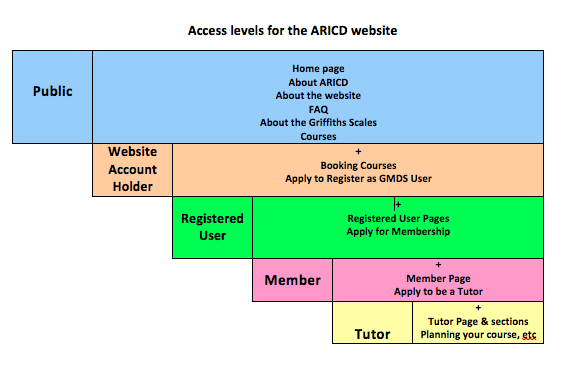 Once you have become a Registered User of the Griffiths Scales, you are eligible to become a Member of ARICD to help support its activities. You can find information about membership benefits and how to apply on the membership page. Once you have been a member for 2 years, you can apply to become a Tutor (more details here). Your application must be approved by the Training Committee.